Join us this week as we kick off our next Entrepreneurship 101 module, Growing Your Business. It all starts with The Art of the Deal, where we’ll discuss how you can succeed when negotiating with various stakeholders. Over the past few months, cleantech has gained momentum around the world. The climate talks in Paris put clean technologies front of mind, and Prime Minister Trudeau’s use of the word over a dozen times in his mandate letters mean that it’s very much a reality for Canadians going forward. 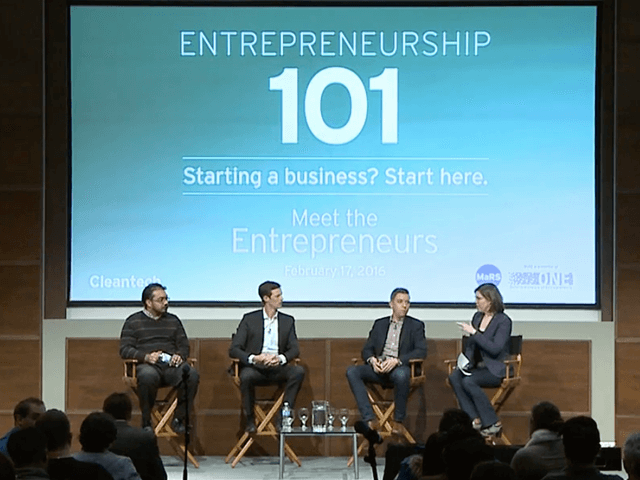 On Wednesday, February 17th, our Entrepreneurship 101 session featured lessons learned from cleantech entrepreneurs. Andrew White, President & CEO, CHAR Technologies Inc.
Panelists shared their stories of being pulled into entrepreneurship, including creating a video, designed to impress friends, and which generated market traction with companies asking for the product. The panel highlighted the need to be adaptive, to pivot and to not be too proud to do what needs to be done, even if that means sweeping floors to make ends meet. They described entrepreneurship as a bit addictive and a huge amount of fun. All were in complete agreement that no matter how they got started, market validation was critical—and the sooner the better. Start small and leverage the names of people you’re already connected to. Borrow other people’s credibility, especially your board members’, to get conversations moving. Make sure you’ve identified areas where you lack expertise and can benefit from other people’s knowledge. The find the right individuals, people that can be your champions, and get them to advocate for you. Raising capital is hard and it takes a long time. Don’t underestimate how long it takes. Forming a board of directors early on can help you focus, get targeted advice and make raising capital easier. Having a professional financial model, presentation, governance structure, etc. will give investors confidence that you know how to run a business and makes due diligence much easier. Be diversified in the capital you go after. Grant applications can take a long time—don’t waste time with ones you stand little hope of obtaining. Find ones that are a good fit and build relationships with the organization upfront. For private equity investors, have them follow you early on, and build a track record and credibility. Due diligence starts right away, so make it count. Entrepreneurship can be a hugely rewarding experience, but it’s not without its challenges. Things will never work out on your first attempt. Be prepared to fail. Fail quickly and move on. Get out of the lab and validate the market. Make sure people are willing to pay for your solution. Watch excerpts from our cleantech panel discussion and hear what our experts had to say.